Solidly grounded in research, this book provides an overview of tested, easy-to-implement strategies for preventing problem behavior in the classroom and responding effectively when it does occur. Part I focuses on prevention, discussing best practices in classroom management and instructional delivery. Part II covers more intensive interventions for students who require individualized behavior support. Chapters describe the use of behavioral contracts, self-monitoring, and functional assessment-based interventions. The authors' model is fully compatible with positive behavior intervention and support (PBIS) and response-to-intervention (RTI) frameworks. In a large-size format for easy photocopying, the book includes more than a dozen reproducible checklists, self-assessment tools, and planning forms. Purchasers get access to a Web page where they can download and print the reproducible materials. 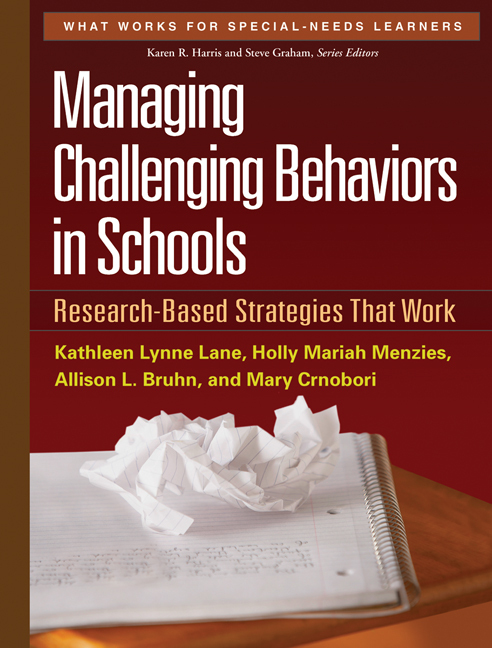 See also Supporting Behavior for School Success: A Step-by-Step Guide to Key Strategies, by Kathleen Lynne Lane et al., which provides a quick and easy guide to implementing seven effective low-intensity strategies in the classroom.